From the moment you enter Asagiri, you will be treated to a balance of traditional Japanese features and modern design. The elegant wooden exterior and hand crafted interior design create an unforgettable experience. 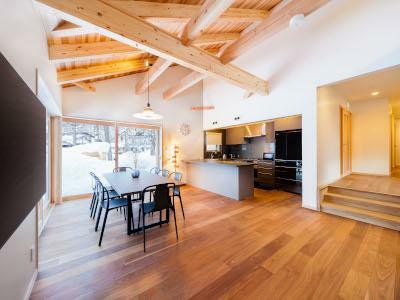 Build Completion: January 2018｜Chalet Size: 194sqm｜Bedrooms: 4｜Capacity: 10 guests｜Bathrooms: 3｜Nearest Resort: Happo One / Sakka Ski Slopes - 1 min walk.